A little laughter came to Facebook’s headquarters in Menlo Park, Calif., Tuesday, in the form of comic legend Jerry Seinfeld. 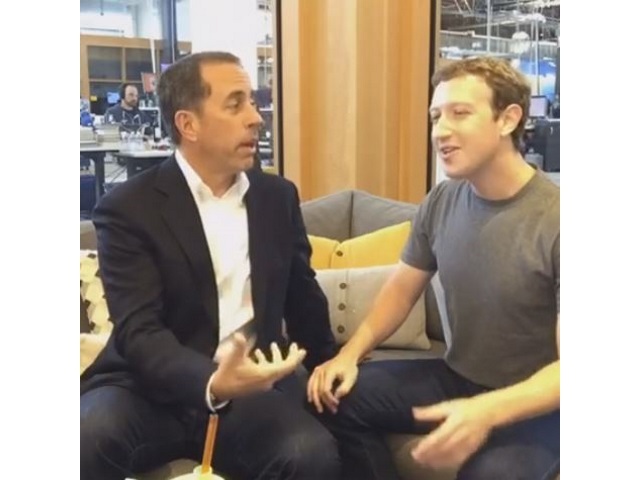 Seinfeld held a question-and-answer session with Facebook employees, live-streamed via Facebook Live, during which he discussed his Comedians in Cars Getting Coffee video series. Live From FacebookI’m live on Facebook from Facebook talking Comedians in Cars Getting Coffee. Prior to starting his Q&A, Seinfeld crashed Facebook co-founder and CEO Mark Zuckerberg’s first-ever town-hall Q&A to be live-streamed via Facebook Live. First ever Live Q&A on Facebook! Leave questions and comments below. Readers: Did you watch either of these live-streams, either while they aired or afterward?